Jenny Chiles at Northrop & Johnson sends news of a major $3.45 million price reduction on Kevin Merrigan's central listing, the 46.94m motor yacht Mr Terrible. Mr Terrible accommodates up to 12 guests in a master suite and four staterooms and her twin 3650hp MTU engines give her a range of 2,200 nautical miles at 14 knots. 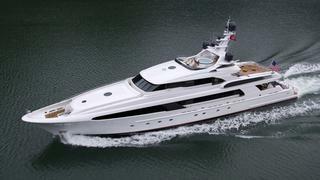 Mr Terrible was featured in the 2008 edition of The Megayachts and also won an award for Best Semi-Displacement motor yacht over 40m at the 2008 World Superyacht Awards. She's now down from $34.95 million to $31.5 million.